Of the currently extant covers that crossed the Kashmir and Jammu borders in the 19th century, those to or from Amritsar constitute the majority. While it has been reported that a sometime Native extraterritorial post office operated for Jammu at Kaţrā Ahluwāliān in Amritsar, there are no special State markings that explicitly attest to that. (The same may be said about Lahore). Sialkot is a similar case, but differs by virtue of the rare Native Duplex obliterator that is known for Sialkot. 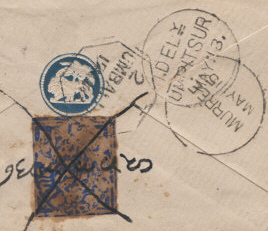 So varied and prevalent are Amritsar postmarks on Jammu and Kashmir covers that even illegible postmarks on covers can be of help in establishing time-ranges. 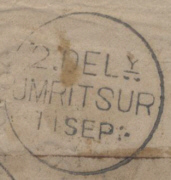 Certain varieties of Umritsur datestamps that first appear on Kashmir mail were already in use before the advent of the Native stamps. The following type, which exists in a number of cuttings, first appeared in late summer 1865. ° Some cuttings over time: The tell-tale differences in the lettering occur rather strongly in the forms of the -SU-combination viewed as a unit. The squashed moths at the bottom could also do with a zoological classification. The type was used primarily as a despatch marking, usually in black, and as an arrival marking, usually in shades of red, which come in a broad range from deep reds to light reddish-orange. They persist in one cutting or another to summer 1872 in red and as late as summer 1875 in black. ° UMRITSUR hexagon. 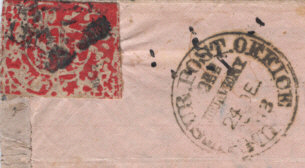 At left a strike in red for 20 July 1866, the first attested use in Kashmir, but is known on other mail before the advent of native stamps. Though scarce, it is sporadically attested to about the end of 1869. As seen in the second detail, it sometimes comes without year dating. What is obliterating the stamp? One expects the Srinagar seal in brick-red, but the pigment looks to be precisely the same shade as on the hexagon. The type is also reported (Hellrigl) in black on 16 December 1875. ° UMRITSUR POST OFFICE 1ST DELIVERY (and 2ND and 3RD). There is now a new earliest dating for the 1st-delivery type of 22 January 1872 (not the example shown above, which is an August delivery). The second image is an August 1874 dating, and is the latest recorded for the 2nd-delivery type. The third image is the only example we have seen of the 3rd-delivery type; it was delivered on Christmas Eve 1873. ° The 1.DELY UMRITSUR. 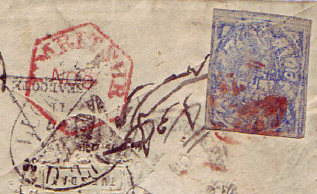 The scruffy example on the upper left dated March 9 is seen on a Srinagar to Amritsar cover dated in manuscript 14 moharram 91 ~ 4 March 1874, and is thus a candidate for first sighting. The example on the upper right, from (some) April, shows better what seems to be the same cutting. 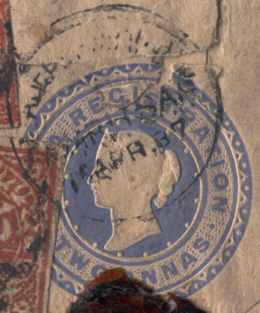 The example underneath is a different cutting (this from an October 1875 cover). Note the spacings between the D and E, for example, and how the T lines up under the E. There is also a second delivery type (no third, so far as we know). 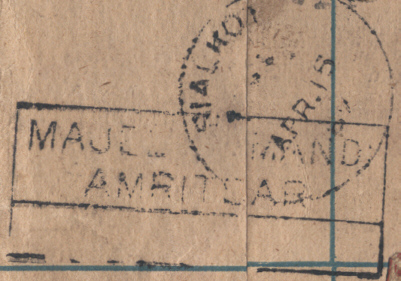 As for a latest dating of the 1st delivery, August 1876 is definitely a possibility for a number are known from late July 1876, even though this date is already past that of the first sightings of the new AMRITSAR spelling in June of that year. ° The 2.DELY UMRITSUR cds. This is first reported for this date 11 September 1874, a detail from a cover in the Hellrigl collection. Since the 1st delivery type is already attested for March, we might be on the lookout for possible summer sightings. ° Type 2 of the 1.DELY AMRITSAR. In these details from June 1877, April and May 1879, notice how the rather narrow T now does line up under the E above it. Most notable perhaps is the constant upper dotting of the second A. The final-R is narrower here, and the spacing between the intial-A and the circle is greater. The latest for both types seems to be autumn 1881, well into the New Rectangulars period. ° The 2.DELY AMRITSAR. 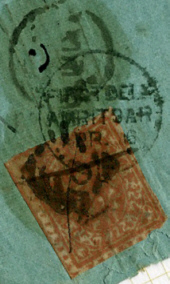 The earliest date we have heard of is for July 1877 on a Kashmir watercolors cover. The example left is from August 1878 and the one on the right is December 1880 with clear cover corroboration. ° The 3.DELY AMRITSAR. This late version seems to have had a limited run, attested perhaps only from July into October this year. The 1st and 2nd delivery types are already recorded from last June 1876 in the watercolor period. One curiosity, if familiar enough, is how Masson’s conversion in red ink puts the despatch after the delivery as told by the datestamp. Our utility converts 11th ‘Assu’ to 25 September, with comfort from said datestamp. The obvious contradictions do not seem to have concerned him, and one begins to suspect that he was using a parallel reckoning in tandem. Lot 183 Blue Sale. ° [blank] AMRITSAR cds. This scarce type is distinguished by the absence of delivery notation at the top. 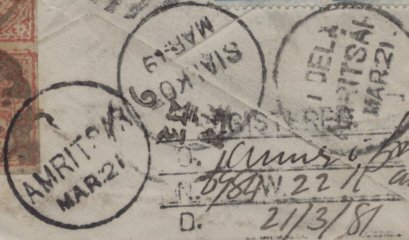 That it accompanies another of the same date that is a delivery marking suggests that it had a different function, possibly as an arrival or sorting stamp. Also seen here is the indented form of the REGISTERED cachet for Kashmir/Srinagar, with the name in manuscript. This detail is from a cover in the Hellrigl collection. 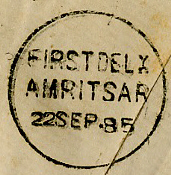 From January 1882 we will see the Amritsar FIRST and SECOND delivery types spelt out as words without year. The year is added in late 1883, some 22 months from now. Third deliveries seem to have been abandoned, at least so far as datestamps go. 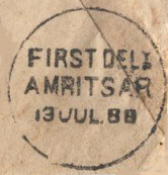 Above: The year number is now added, perhaps from November 1883, to the FIRST and SECOND delivery types for Amritsar. There were distinct cuttings: note for example how the Ts line up on the item to the right above in contrast to the other. The basic type was superseded by curved AMRITSARs in 5 lines at an unknown date. Above: The Second Delivery type with year date is somewhat scarce, and there may be only one cutting. The earliest date we know (Bard) is from 25 January 1884. While the latest we know of is for June 1886. 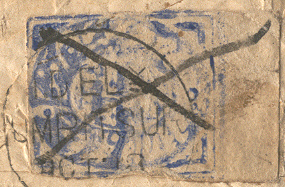 This registration cachet was seen on an April 1887 British postal stationery letter (2a blue Victoria embossment). We have of late discovered the name of a village within Amritsar precincts by the name MAJITHA MANDI, and there was indeed a post-office there. Sometimes the first part of the name is rendered MAJITHIA. We offer this identification for now. And here is the Amritsar strike on the embossment mentioned above. We wonder whether the curved inscription around the top is not the same as that on the registration cachet. We have not heard a report about either of these markings. 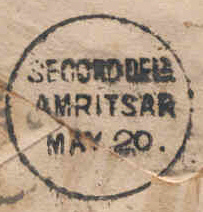 The large-diameter curved AMRITSAR 2ND DELY in four lines (not the later five-line type). Our provisional date range is autumn 1887 to September 1888. The first delivery version, which we only presume exists, would seem to be scarce by comparison. The curved AMRITSAR five-line delivery type. We have no sure advent date, but point to autumn 1888 as likely. These are of smaller diameter than the other curved-type predecessors seen in the February 1888 entry above; the smaller diameter perhaps necessitated the 5-line setting as opposed to the 4-line of the larger implement. 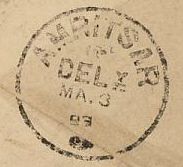 Above: The 2nd DELY 5-line type in a different cutting, this from January 1892, the latest date we can show for the general type. Thick-lettered curved AMRITSAR 1st DELY with fleuron (?) at the bottom (i.e., 6 ‘lines’ in all) here reported for 3 March 1893. We have seen no other reporting of this distinctive type, and wonder whether a second-delivery version is known. 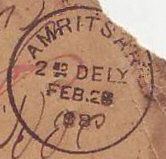 The latest (also the earliest) curved AMRITSAR 3RD DELY that we can show, April 1894. It has gone back to the 4-line format. We have no reports on its date range. By the way, the manuscript scribble on the image is the year samvat 1951.